A Pleasing Alternative to a log fire. Fire Stones for those with contemporary decor, for those with a modern flair, for those yearning for an alternative to the ubiquitous gas log and for those who just want something different. Fire Shapes are made from the same high-heat resistant ceramic-bonded refractory material we use in the making of our gas logs - they will NOT explode like real stones when placed in a fire. 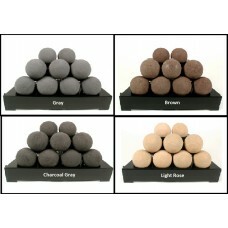 Standard sets are available in the popular sizes, or in four different assortment packs. Set sizing guidelines are available here. Fire Shapes sets are used on our Custom Pan Burners (CS) for single face, double face and multi-sided fireplaces. Custom Embers Pan Burner (CXF) is for single sided fireplaces only. Please contact us with your fireplace dimensions and set composition desires if you do not see anything to your liking from our offering. 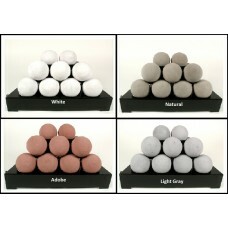 Fire Stones sets and assortment packs are available in single colors Natural Color (tannish gray, the base material color) and seven Ceramic Stain colors made from Backyard Blazes proprietary formulation, including White, Black, Dark Gray, Light Gray, Beige, Brown and Adobe Red. See a color pallet at bottom of page.